The tonsils are collections of lymph tissue located at the back of the mouth (palatine) and tongue (Lingual). They are composed of special cells that help fight infection. Small pits are present on the surface of the tonsil and then extend into the tonsil as spaces called tonsillar crypts. The tonsils that typically cause tonsillitis are called the palatine tonsils. The same type of tissue that forms the tonsils also forms the adenoids. 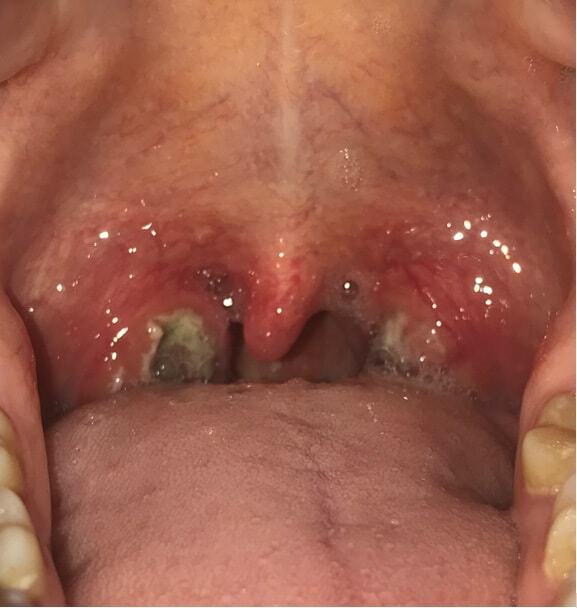 Tonsillitis is inflammation of the tonsils in the mouth (the palatine tonsils). Viruses are the most common cause of tonsillitis but bacteria can also be to blame. The symptoms of tonsillitis include sore throat, difficulty swallowing, bad breath, fever, swollen neck glands, loss of appetite, change in voice, muscle aches and fatigue. The tonsils generally become red and swollen and may have pus visible on the surface of the small pits of the tonsil.